This beautiful one of a kind unique handmade bridal tiara is guaranteed to make you feel like a princess on your big day. 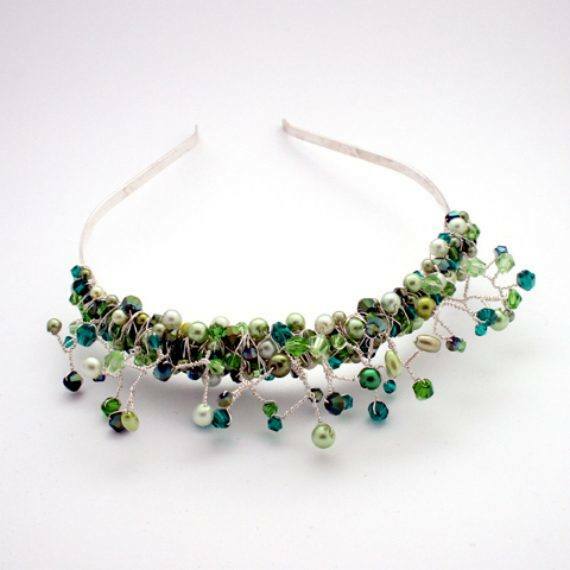 Featuring handmade silver plated wire branches adorned with a mixture of glass pearls and crystals in complimentary shades of green but can be made to order in any colour scheme. All of the branches are fully moldable so can be adjusted on your big day to fit perfectly with your chosen hair style. Matching bridesmaid hair accessories can also be order as well as bespoke bridal jewellery to match. Most of my bridal jewellery and accessories are made to order to make it special just for you however this one is available to buy now as it was created for a wedding fair. If you have any questions then please use the CONTACT SELLER button to get in touch.